As May transitions to June, we're shifting focus from the shining green emerald to the luminous pearl. What could be better to mark the change than a look at a set of jewelry set with both? Today, we're focusing on the fascinating pearl and emerald jewels that have been worn by two Duchesses of Gloucester. 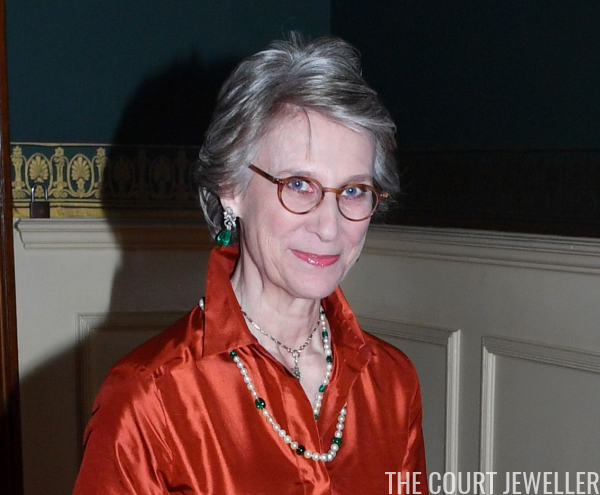 These beautiful emerald and pearl necklaces come from the wedding gift haul given to Birgitte's mother-in-law, Princess Alice, Duchess of Gloucester. The London correspondent for the Age visited the wedding gift display in October 1935 and remarked, "The jewels naturally attract the most interest, and they have one common feature -- a lining to all the cases of the Duchess's favorite color, a blue not very different from the shade now known as Marina blue. The necklaces and pearl and emerald ornaments, given by the King and Queen, contain one pearl big enough to cover a florin, and an emerald drop as big as a shilling." The case that included the two pearl and emerald necklaces was also fitted with a pair of bracelets and a magnificent emerald and diamond brooch, which has three emerald pendants. The Winnipeg Tribune described the suite as "a complete parure (two necklaces, two bracelets and a brooch) of cabochon emeralds (as big as pigeon's eggs), pearls and diamonds." You'll note that both Duchess of Gloucester also often wore a pair of diamond and emerald drop earrings; Leslie Field notes that Princess Alice had the earrings made by removing the two larger, longer drops from the suite's original brooch. The two pearl and emerald necklaces were strung with pearls and emerald beads that Queen Mary took from Queen Alexandra's Indian Necklace. According to Hans Nadelhoffer, the necklace (which was strung with pearls, rubies, and emeralds) was commissioned from Cartier in 1901 to coordinate with new Indian gowns sent to Alexandra by Mary Curzon, the Indian viceroy's wife. He notes that for "this first commission from the palace, the Paris designers created a light and elegant Indian-style necklace ... Alexandra was pleased with the piece and wore it frequently." When Mary had the pearls and emeralds restrung into a pair of necklaces for Alice, the necklace was apparently crafted in such a way that allowed the pearls and emeralds to be strung in different patterns and at different lengths. Alice wore various versions of the necklaces throughout her life, including the original necklaces in portraits by Dorothy Wilding in the late 1930s (where they were worn with a third, all-pearl necklace) and by Madame Yevonde in 1959. 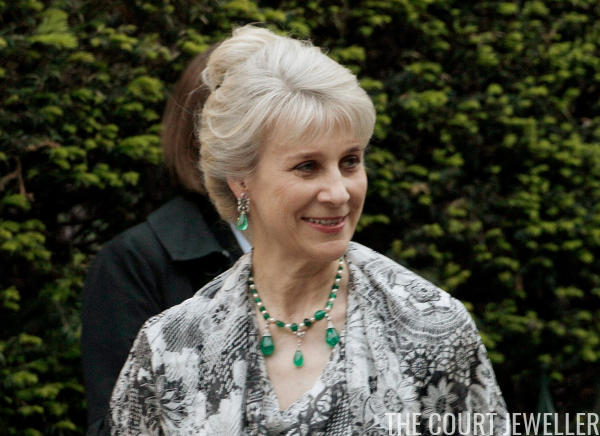 The necklaces are now worn by Alice's daughter-in-law, Birgitte, the current Duchess of Gloucester. She has also worn different lengths and configurations of the necklaces. 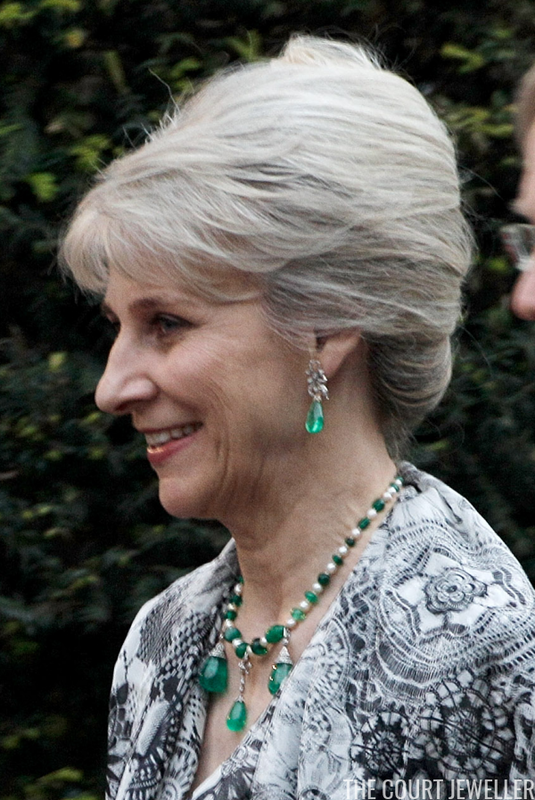 In the photo above, taken at the Duke and Duchess of Cambridge's pre-wedding gala in 2011, she wears a shorter version with alternating emeralds and pearls, along with both pendants and one of the pendants from the suite's brooch. She also wore the alternating shorter necklace alone on Ladies' Day at Royal Ascot in 2001. More recently, Birgitte wore the original versions of the necklaces as presented to Alice in 1935. For Queen Elizabeth II's birthday celebrations at the Royal Albert Hall in April 2018, she wore the shorter necklace layered inside the neck of her gown and the longer one tucked underneath the dress's collar.